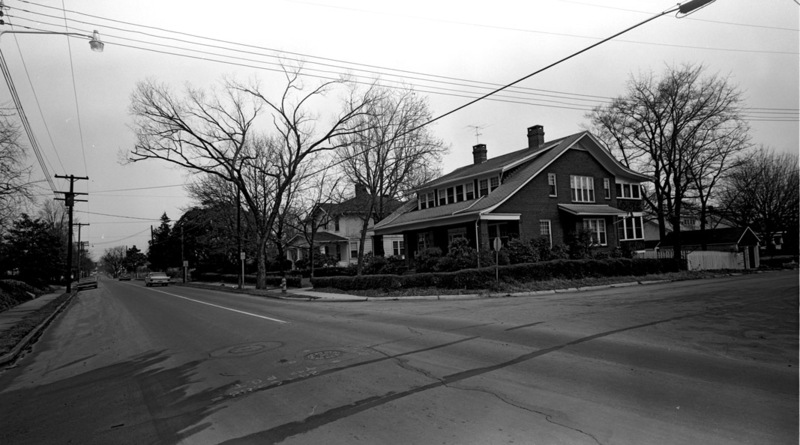 The four Craftsman-style houses at the northeast corner of Parker and Vickers (two on Parker and two on Vickers) remain essentially unchanged from the view of this corner in 1967. However, the major change occurred immediately to the northeast of these houses, and the Durham Freeway was contructed just behind them beginning in June of 1967. The major visible change is in the re-routing of Vickers that occurred with the Freeway construction - notice in the top picture that Vickers heads straight north (and south). In the present day photo, Vickers no longer connects with its northern remnant, but turns to connect with Gregson Street. This converted Vickers from a minor two-way neighborhood connector to a one-way thoroughfare, significantly altering the character of the neighborhood.